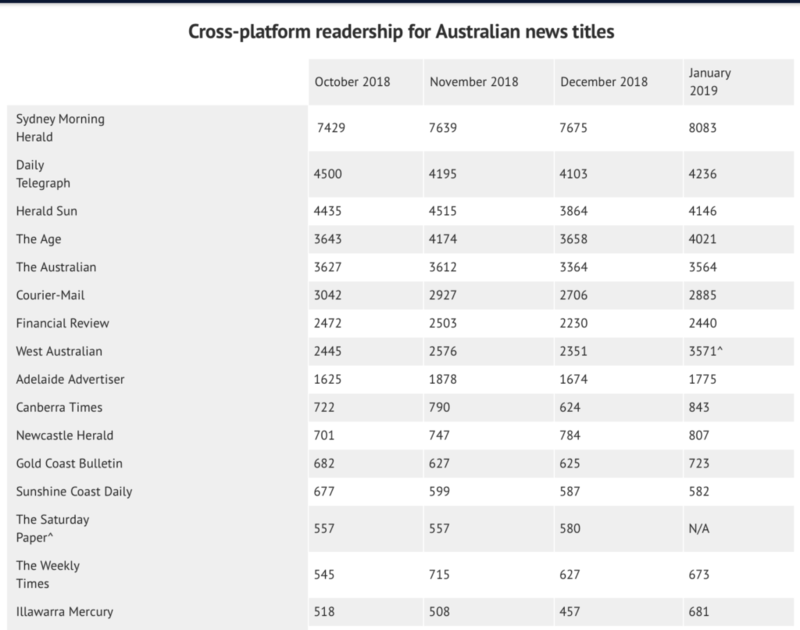 Fairfax is today reporting terrific growth in readership for The Sydney Morning Herald as reported by NewsMediaWorks, a publisher run organisation that tracks readership combined with print circulation. The Sydney Morning Herald started 2019 as the most-read title bolstering its lead over News Corp titles after recording more than 8 million digital and print readers for the first time. The Age also increased its audience from 3.66 million to 4.02 million over the month. Here is part of the table at the SMH article, listing results. I am about to start harvesting data for over the counter sales in newsagencies for the last quarter. Early indications are of further significant declines. What constitutes a reader in these numbers? Roy Morgan’s readership numbers indicate nearer 4 million for the SMH, half their claimed readership.